Nina Maxine Groves (left) and Donna Sue Groves (right) stand in front of the "Friendship Quilt" in 2009. The "Ohio Star" at Lewis Mountain Herbs & Everlastings. This was the very first quilt square hung in Adams County, OH. Nina Maxine and Donna Sue stand in front of their "Snail's Trail" quilt square in 2013. ​Pieced Together is the first documentary film about the American quilt square trail movement. Directed by Peabody Award-winning veteran of ABC News, Julianne Donofrio, Pieced Together tells the story of how one woman’s love for her mother changed the American landscape and saved her life after job loss, breast cancer, and multiple health concerns. Donna Sue Groves had an idea: pretty up an old barn for her mother Nina Maxine, a celebrated quilter, by hanging a wooden square painted to look like a traditional quilt block. A community organizer by trade, she thought why stop with just one square on one barn? So Donna Sue got together with her neighbors in Adams County, OH and created a driving trail of squares hung on barns to attract tourists looking for a day trip who might stop and spend money on gas, food, or crafts made by local artists. 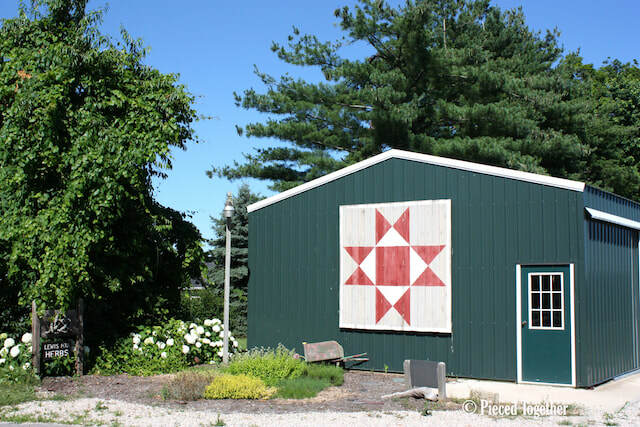 The first quilt square, an "Ohio Star," was hung on the Lewis Mountain Herbs & Everlastings farm in 2001; the idea sparked a grassroots phenomenon and a new form of American public art. Nina Maxine finally got her quilt square, a green and purple "Snail's Trail," in 2003. 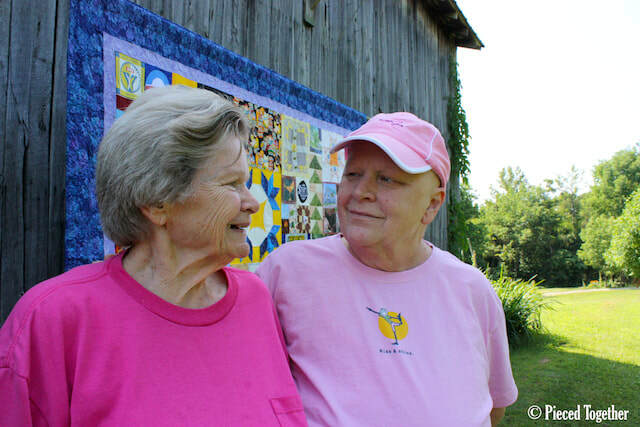 Filmmaker Julianne Donofrio stumbled upon her first quilt square in Tennessee in 2009, and learned of Donna Sue Groves through a “pink” web page created by the quilt trail organizers in Garrett County, MD. They were raising funds for Donna Sue who had lost her job and was battling breast cancer. “I guarantee you, that had it not been for the quilt trail community, that I would not be here today,” says Donna Sue Groves. Now, more than 40 U.S. states and parts of Canada have quilt square trails - and there are hundreds of organized trails! Donna Sue never planned on creating a cross-country community but it is this very community of friends and strangers that is helping her put the pieces of her life back together after job loss, breast cancer and numerous health concerns. “I feel honored to witness and document what will one day be a chapter in our American history,” says Director, Julianne Donofrio. Pieced Together debuted at the National Quilt Trail Gathering in 2016 and was an Official Selection of the 2016 River’s Edge International Film Festival, the 2018 Ocean City Film Festival, the 2018 Ozark Foothills FilmFest, the 2018 Oil Valley Film Festival, and the 2018 Great Western Catskills International Film Festival. Pieced Together won Best Short Documentary Feature Film at the 2017 Buffalo Dreams Fantastic Film Festival and the Audience Award: Feature at the 2018 Indy Film Fest. Julianne was an official participant at the 2017 & 2018 Appalachian Studies Association Conference in Blacksburg, VA and Cincinnati, OH. ​The square pictured on the film poster is called "Clay's Choice." Nina Maxine and some friends surprised Donna Sue with this second quilt square on the backside of their barn in the hopes that it would lift her spirits prior to another hospital visit. The square faced their homes and was meant just for them. It is another reminder of a promise kept and a promise to keep fighting, no matter what tomorrow may bring.